Phew! As lovely as this month has been, I'm pleased to see the back of January and mainly because it means we're one month closer to warm weather! Although, the end of January doesn't mean the end of winter and so there's still plenty of time to embrace ALL the layers. Speaking of which, I'm still head over heels for neutrals. Black, grey, beige, white, brown and more. In particular, I've developed a newfound appreciation for throwing as many neutrals as possible into one look. The trick? Lots of layers and tons of textures. Above all else, there's something incredibly chic about neutral outfits. The colours move from one to the next and tend to lend their hand to most pairings, including accessories. By building interchangeable neutral outfits within your wardrobe, you're giving yourself a load of new pairings that help to avoid the last-minute outfit dilemmas once and for all. My favourite discovery of last year was adding to my denim collection, and this doesn't only include jeans in every cut and colour imaginable, but also pinafore dresses, dungarees and skirts. Wardrobe essentials; classic neutrals. So, as I mentioned above it's aaaaall about the texture. If every element of a neutral outfit shares the same material, it's going to end up looking rather bland. Your best option is to dig into your wardrobe, or shop around for interesting textures and materials that make you want to reach out and touch them. 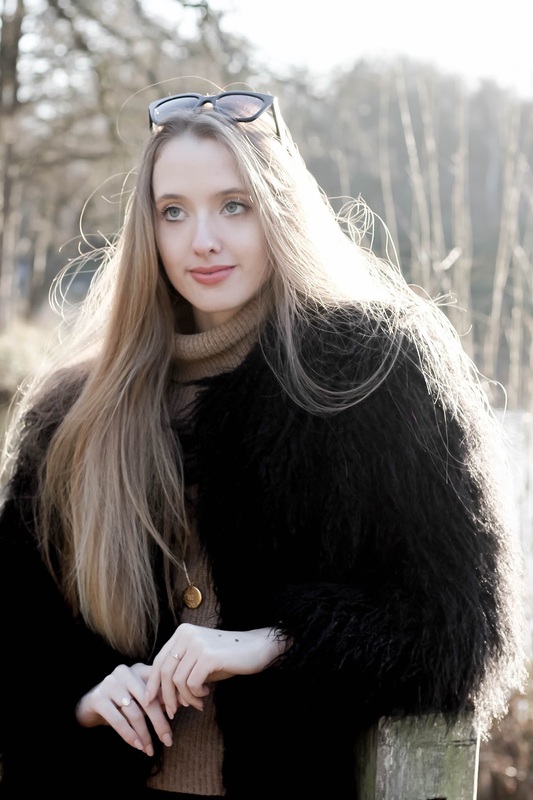 With that said, you can imagine how much I love this black fluffy jacket, right?! The latest addition to my wardrobe and I'm completely smitten. Better yet, don't stop with the clothes. Spread the focus to footwear (hello OTK suede boots, satin stilettos and vinyl shoes), as well as jewellery. My favourite go-to is warm, delicate jewellery. 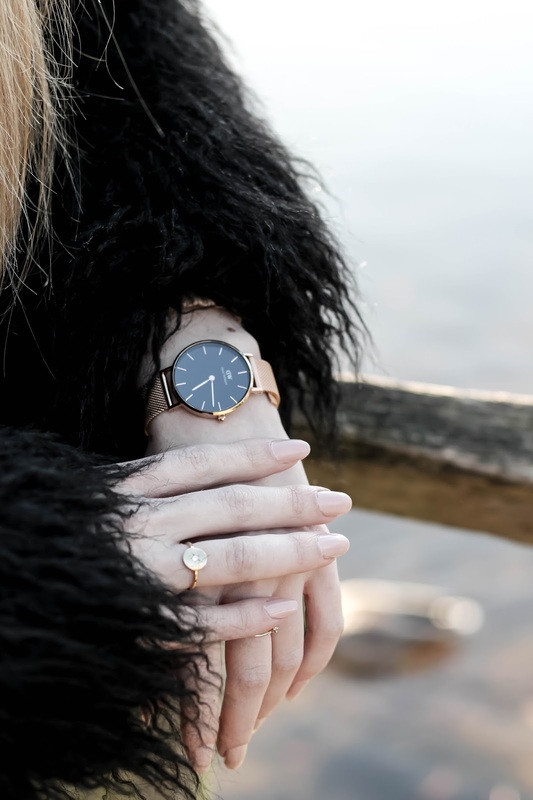 Dainty rings, metal watches and layered necklaces - nearly always gold, or rose gold. The pendant I'm wearing is by ChloBo, and features my Zodiac sign (Virgo), Gold Plated on 925 Sterling Silver. The hammered disc design is exactly what I dream of when I think about textures and I love the idea of layering a couple of these to fill even more of the negative space. Also, it feels really nice in between the fingers. Is that strange to say? Probably. But it does feel nice. Do you wear many neutrals? How do you feel about entirely neutral-coloured outfits - chic or not? Let me know in the comments below! Such a great look! Love the coat and boots! In love with that fluffy jacket! Looks amazing with the sweater, definitely gonna try my hand at mixing and matching neutrals. This outfit is so chic! I have really come to appreciate neutrals too, but as per your advice, I may have to shop for more neutrals. Oooh, I also love your nails! Anyway enjoy the rest of the week Gabrielle. Aaaah its so good to be back on your blog Gabrielle! I tell you, you sure know how to layer effortlessly and elegantly. Me? I literally wear 5 layers under one knit jumper haha! Great outfit with superb OTK boots! I swear it's impossible for you to look bad, Gabrielle! That coat would transform me into a bear but you look so chic! I love wearing neutral looks, and this one is absolutely beautiful! I absolutely love the stylish coat, and cozy turtleneck! Perfect layering. That coat is too gorgeous! I love the outfit you look great in that outfit! My kind of winter outfit here for sure. Very effortless stylish outfit with a bang with that coat. Love it Gabrielle. You look wondeful! your pendant is so cute! I love how it looks layered over the turtleneck! I lIke boots))) you have very beautiful shoes, and the outfit turned out to be ideal for spring. This is a perfect outfit, even the jewellery fits so well. Your hair is so pretty I'm very jealous! You look so good in layers dear, seems like you're enjoying the weather. Love your layering, those gold accessories are a gem. gorgeous outfit Gabrielle, I really love the shaggy jacket / cardi <3 and the necklace is so beautiful! 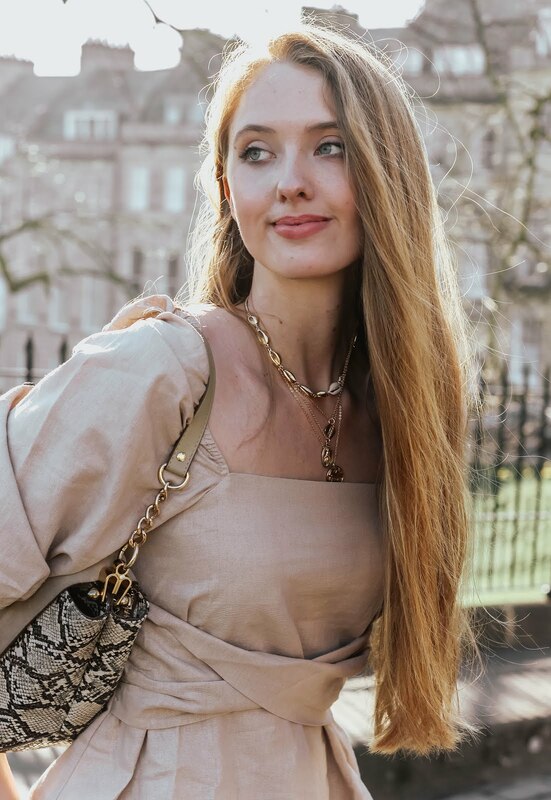 YAYYY for this post- I literally just published a post about styling neutrals the boho way, so I feel like we are blog twins :) Your tips are all spot on- it's totally about the texture! You look beautiful as always and I'm obsessed with this fluffy coat. Love love love all your jewelry pieces! Those boots are AMAZING! Also the light in these pictures is gorgeous. I love layering over winter but I am definitely ready for some warmer weather! What a perfect way to layer neutral colors! Those over the knee boots are to die for as well as that furry coat! Such a great outfit, Gabrielle! You look like a total diva in it! Neutrals are synonym of chic for me, especially if they're enriched by textures like in your outfit. That coat is fabulous, by the way! You are so gorgeous!! love your style. I don't wear much neutrals, but would love to experiment with them much more this year. Love the layering you did here! Beautiful as always! I'm so looking for warmer weather too! January has been so depressing. It doesn't mean that we should have fun with style though, and playing with all these textures is a great way to make dressing for the cold a lot more fun! I'm definitely a neutrals girl. I actually had to finally force myself to buy some colors to add to my wardrobe! But, I'm drooling over everything in this outfit. Especially the OTK boots. AND all of the accessories. Girl, your closet is my dream closet! Such a nice textured outfit. I can't resist adding a colourful bag or scarf or necklace to a neutral outfit, haha! I admire others who can wear neutrals well, but I always hunt for a little pop of colour! Your jacket looks so soft too, I can see why you had to get it. I don't know why I've never really thought of how simple it is to layer textures - or to do it myself! The final look is such a easy, chic combination. I think my problem is that I don't actually have many different textures in my wardrobe - something I definitely need to fix! I couldn't agree more that spring needs to hurry up and get here! Layering has been fun, and I'm glad we're through January but I'm SO ready for summer dresses and bare legs again! I live for the warmer weather and while it has been fun (in a way) to experience a snowy winter, the novelty is wearing off for me and I can't wait for spring to get here! You look gorgeous, I love entirely neutral-coloured outfits! Your necklace is so cool! So stunning Gab, love your style so much! Like always you look so so stunning - this all pictures are amazing. Beautiful pictures! Neutrals are always my go-to and I'm so glad to see the back of January as well!! I think my closet is mostly full of neutrals: sweater, shirt, skirt..I just love these colors! The tip to add texture to a neutrals outfit is great dear! The final result is so on point! I love theses neutral tones with your amazing furry coat ! This is coat is so stunning ! I LOVE how you paired together these neutral tones for such a pretty look. You are beautiful! I wear a lot of neutrals, they are just so elegant and flattering. Anyway, you are a master in combining and layering nutrals, Gabrielle! You outfit looks so stylish and classy, and very unique as your style is! 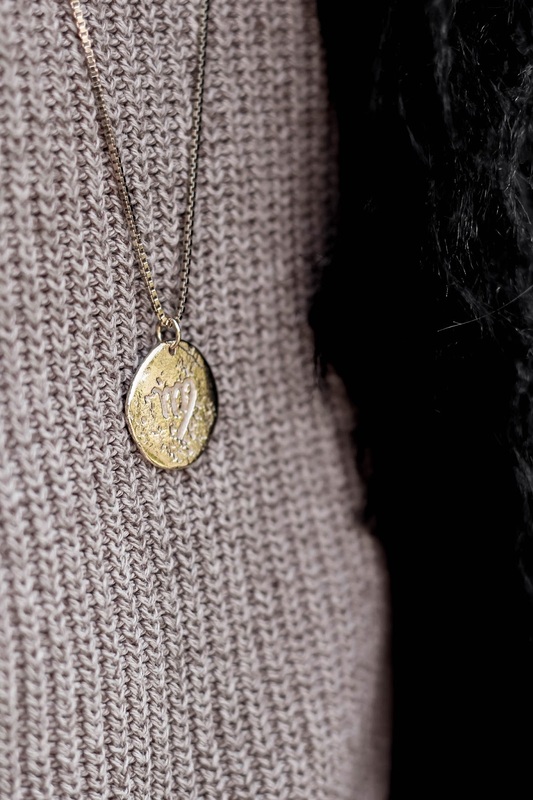 My fav part in about dainty jewelry, it's the kind of accessories that I always prefer! You look flawless, have a great week, sweetie! You look lovely.. also love the jewelry. You look so fab! And yes, texture texture texture! Would love to have a rummage round your wardrobe one day, you always have such lovely stuff! I absolutely LOVE this outfit! It's so chic and the mix of neutrals is indeed perfect. Prior to having Aviah, I didn't reach for neutrals nearly as much as I do now. I know it's because, as you've mentioned, when I'm on a crunch for time, which is nearly all the time (lol), I know I can grab them and mix them up to create an effortlessly stylish outfit. I love that turtleneck you're wearing, the camel shade is so pretty, and you are rocking that fur coat! Thanks for sharing these tips with us, beauty, and I hope you're having a great start to your week so far! Texture really is important. I LOVE this look, and the coat really makes it! I think most of my wardrobe is neutral, but I don't play with texture near enough. This is inspiring! I've been following you for a while now and your posts are always on point! I love you said about purchasing textured pieces that makes you want to reach out and touch them! You definitely inspired me to do a better job at picking out these unique pieces. Thank you! I love how simple your outfit but stylishly looking. This outfit was beautifully put together! I love how classic colors always look so good together and how you added some texture. Your coat is just fabulous and I love the dainty jewelry too! As always I love your outfit ! That coat and boots are gorgeous ! Indeed, you really can't go wrong with neutrals, especially for layering. Black simply goes well with almost anything, it can highlight any piece or be the highlight. Lovely turtleneck and jacket combo dear, your cute pendant really shines out. Such a gorgeous outfit. Love how you style neutrals. The jacket is so cute!!! I'm with you Gabrielle! I'm a a big fan of neutrals and texture really brings neutrals out. Love your jewelry as well. Love your fluffy coat! Too cute! I am in love with your boots my dear! They are so pretty!!! Neutrals look great on you!